Jennifer Seigel: Why has a new kosher cookbook sold over 24,000 copies in a week? The Jewish Ethicist: Legitimate larceny? Jordan "Gorf" Gorfinkel's Jewish Gen-X strip with ecumenical appeal, Everything's Relative. Online exclusively at JWR. Daniel Pipes and Jonathan Calt Harris: Does Columbia U hate America? Jeff Jacoby: Empowering a terroristocracy in the name of 'peace'? Chosen Words: A new JWR feature --- a newsletter for spiritual and personal growth written for the layman and dealing with real life issues. Charles Krauthammer: Don't Go Back to the U.N.
Zev Chafets: The big question: Can Arabs handle liberty? Why has a new kosher cookbook sold over 24,000 copies in a week? http://www.jewishworldreview.com | Culinary snobs tend to snicker at kosher cookbooks. Despite some of the fabulous new kosher wines, chefs and restaurants that hold their own with the best, the perception persists that kosher means second-class. Until now. Kosher By Design: Picture-perfect Food for the Holidays and Every Day published by ArtScroll/Shaar Press (CLICK ON LINK TO PURCHASE) is chic, elegant and includes upscale wine lists that would raise more than a few connoisseurs' eyebrows. Authored by Susie Fishbein, editor of the best-selling book The Kosher Palette that took the gourmet world by storm a few years ago, this is one cookbook that is out to change the image of kosher food forever. 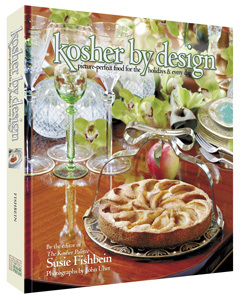 The buzz surrounding the publication of Kosher By Design has been tremendous. 24,000 copies sold the first week and a second edition was immediately rushed into print. It's no wonder that Publisher's Weekly called it "a beautiful volume that straddles the delicate line between modern and traditional and between refined cuisine and everyday ease." One look at it, and it's easy to see how it won this accolade. Gracious ambience and sophisticated food presentation play a major role in successful at-home entertaining. To that end, the author spared no effort in obtaining the services of world-class party planner Renee Erreich and of Larry Sexton, the florist from Atlas in New York's Plaza hotel, to create spectacular table decor and floral arrangements. More than 120 magnificent photos by award-winning photographer John Uher, whose work appears regularly in some of America's most prestigious food and lifestyle magazines, convey the sumptuous dishes and glistening wines in settings fit for royalty. The result is a dazzling book of gourmet glamour. YOUR BUBBY WILL BE PROUD! Rivaling the elegance of the table decor are the 250 recipes. Utilizing the vast and growing list of kosher ingredients available today, the book delights in taking a traditional dish and giving it a modern spin. It coyly suggests that Grandma's gefilte fish was very nice, but isn't Tri-Color Gefilte Fish (using salmon as the striking middle layer) much more interesting? Chicken is coated with exotic Asian flavors. And matzo balls, stuffed with an outrageous vegetable filling, will never be the same again. The best thing about these recipes is that they produce a dish that looks like you've been slaving away in the kitchen for hours, but really require a minimum of fuss. If you're a busy professional (and/or a harried, underpaid, overworked parent!) planning to entertain a few dozen of your kith and kin, you'll find this book user-friendly and practical. The same is true for the homemaker who wants the right touch for a special occasion. Think our reviewer is exaggerating? You can view a number of pages and/or order the book by clicking here. And if you decide that this book is worth purchasing -- and we suspect you will! -- please alert others by using the "email a friend option" above. (Sales help fund JWR). First of all, it's comforting to know that every recipe was triple tested before it made it into the book. Instructions are simple and straightforward, as are the names of the dishes. There are none of those ambiguous recipes called "Aunt Dora's Supreme Surprise." You want to cook a rack of lamb? You'll find a recipe called "Rack of Lamb with Fig-Port-Shallot Sauce." You want to try your hand at a chocolate pecan pie? You'll find a recipe called just that. The physical construction of the book reflects this no nonsense approach. A strong, laminated cover and the 7 1/4" x 9 1/4" page size stands up to kitchen spills and splatters and make it easy to use; and the concealed-wire binding keeps the open book flat on your kitchen counter. The book is so well indexed and cross-referenced that locating a specific recipe is a matter of seconds. And the "extras" go a long way. Suggested menus for every holiday and complementary wine lists of new, cutting-edge kosher wines take the worry out of planning. In addition to a superlative Passover section, there is a Passover Index indicating modifications for year-round recipes that broadens the range of Seder possibilities. Savvy cooking tips and crystal clear instructions make preparation a snap. The author wants you to feel as though your personal "culinary coach" is standing beside you, talking you through every step of the process. What does this all add up to? Confidence in the kitchen --- the confidence to whip up a new dish with expertise and serve it in a grand manner. Are these recipes only for special occasions? Well, yes and no. Many of them, such as Herbed Brown Rice or Greek Pasta Salad are quick to prepare and fit right into a relaxed meal. In fact, there are several that take store-bought products and give them that extra touch you'll be proud to serve. But you might want to reserve the Champagne-poached Salmon with Cream Sauce for a special holiday feast. Fortunately, there are many days for feasting enshrined on the Jewish calendar. The genuine respect for the Jewish traditions that gave rise to these festive meals is another valuable asset of this book. Its vibrant approach to the Jewish holidays is communicated easily in its pages. In addition to presenting kosher food to contemporary palates, the book also illuminates the meaning of the Jewish holidays and the origins of many traditional foods. Cooking kosher now has the kind of gourmet potential never dreamed possible in Grandma's day. Kosher By Design is destined to become a classic simply because its time has come: the range and quality of kosher ingredients currently available equals the growing demand for cultured at-home entertaining. No doubt, this is a cookbook that will find its way into thousands of kitchens, whether or not they happen to be kosher. Appreciate this piece? Sign-up for the daily JWR update. It's free. Just click here. Jennifer Seigel is a New York-based writer. Comment by clicking here.